RunningBrooke reinvested $92,000 into the Alexandria community and celebrated with our 2017 grant recipients to kick off the work being done with local nonprofit partners this year. 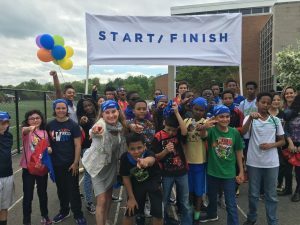 All fifteen 2017 Move2Learn grant recipients focus on RunningBrooke’s mission to get kids active to spark and enhance their academic performance. Studies show that active kids have better focus, do better academically, have improved behavior, and are more physically fit. This year’s partners provide programs for children that range in age from preschoolers to high school students. Activities take place before academics and tutoring, during and after school, and get kids moving in a variety of ways, from dance to yoga to running. In total, RunningBrooke will grant $92,000 to 15 Alexandria partners who collectively serve more than 5,000 children. 2017’s partners include: ACPS Bicycling in the Schools (BITS) Program, Alexandria Tutoring Consortium, ALIVE! Child Development Center, Center for Alexandria’s Children, Child & Family Network Centers, Communities in Schools NOVA, Community Lodgings, Friends of Huntley Meadows, Girls on the Run NoVA, Jane Franklin Dance, John Adams Circus Club, Local Motion Project, QuinTango, TC Williams High School Dance Program, and YoKid. “We were honored that so many groups applied to partner with us in 2017. We received applications from many great organizations with important programs, and our grants committee had a difficult task to select the ones that best align with our mission. We are thrilled to work with this year’s partners. Their programs to get kids active are a good fit for our Move2Learn program. We have a lot of great things coming up this year, including our next Educational Summit in June. We couldn’t be more excited about what we have in store for Alexandria this year and for years to come,” said Brooke Sydnor Curran, RunningBrooke’s Founder and CEO. Developing bicycle skills and safety training as part of the PE program. To mentor young readers and bring their reading up to grade level. Child-directed play, exploration, and active learning are guided by regular use of assessment tools to identify studentsʼ strengths, weaknesses, interests, and stages of development. Each day starts with gross motor exercises and includes music/movement in circle time. Twice daily, children play outside, including large motor games related to the lesson plan. During center time, children choose from activities related to ﬁne and gross motor development. Running Brooke bracelets and happily shared with their classmates. At Learn & PlayGroups, children ages zero to ﬁve participate alongside their parent/caregiver in developmentally-appropriate, facilitator-led activities and learning that help them develop positive relationships with each other while connecting to community resources. CFNCʼs Health and Wellness Program combats obesity, encourages movement, and promotes healthy lifestyles to improve low-income preschool childrenʼs ability to learn. As part of our HighScope curriculum, children are given opportunities to move and learn on a daily basis through various kinetic activities. 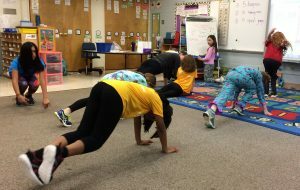 The objective of the CIS of NOVA Healthy Hammond Initiative is to stimulate studentsʼ desire and ability to learn through creating cost eﬀective opportunities for them to engage in more physical activity during, and after, the school day. In addition to the goal of increasing studentsʼ overall health, the programs proposed, including a garden, an after school soccer and yoga program, and a school-wide health fair and fun run, will provide incentive for students to come to school, stay focused, and engage in positive behavior. Community Lodgingsʼ Youth Education Program (YEP) serves 110 at-risk Alexandria students each day at our Fifer and New Brookside Learning Centers located in the Arlandria community. Through the YEP, they provide after school, summer enrichment and mentoring programs that promote studentsʼ academic success. Offers movement (hiking, camp games) programs to children of all ages during the school year, after school, at Spring Break and over the summer. They serve about 1,000 students per semester as school groups learning about nature and hiking during ﬁeld trips. 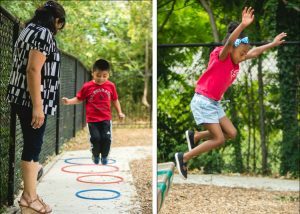 They also oﬀer 28 summer camps that serve 400+ students using movement, hiking, and outdoor play to learn about a variety of nature-based topics. The Art and Nature program emphasizes drawing, nature observation, dance, movement based learning and hiking (1-2 miles daily) through forest and wetland habitats. GOTR NOVA is focused on ensuring all local girls have access to high quality youth development programming through GOTR and, speciﬁcally, to increase access to the program in underserved communities. Physical activity, speciﬁcally running, is woven into the GOTR program to help build habits that lead to a lifetime of health. Burpees! Running Mans! And Squat Jumps! Jane Franklin Dance will partner with Jeﬀerson Houston PreK-8 School for after school clubs in movement during winter, spring, and fall 2017, winter 2018. 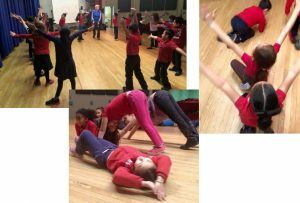 The students are led in movement and theater exercises that incorporate health and ﬁtness activities, provide creative interaction, and stimulate collaborative interaction. The process-oriented sessions emphasize the accumulation of skills over time and the mastery of basic movement vocabulary. An after school circus curriculum that is unique in that there are many different skills that can be incorporated ranging from tumbling and gymnastics to other core/balance activities such as unicycling and balance boards, to hand-eye coordination including juggling, flowersticks and spinning plates. Local Motion Project brings meaningful dance education to Alexandria by providing a holistic approach to dance education, they expose our community to the social, emotional, mental, and physical benefits of dance. They engage students in learning environments in which they collaborate, communicate, and develop their creative voices and dance technique side-by-side. They use dance to teach skills that extend beyond the classroom, and to create connections to our community and the world at large. QuinTango Incʼs Tango & Soccer at Tucker Elementary is a gender-balanced program that develops life skills – respect, focus, conﬁdence, diligence – by teaching basics of soccer and tango. Emphasizing the 5 Pʼs of performance (poise, pay attention, partnership, personality, persistence), these bilingual instructors mentor life skills (respect, focus, conﬁdence, diligence) while preparing students for a public performance of soccer rudiments and tango dance. To implement an after school dance program as part of the Hip Hop dance club, “Get Up Off of that Beat”, Foundations of Urban Dance. Will introduce students to some of the most popular forms of dance in today’s urban culture culminating with a performance at the end of the year. To offer yoga classes to students at Jefferson-Houston Elementary school and to children in Stop Child Abuse Now (SCAN) workshops. Since its inception, RunningBrooke has raised $1 million dollars, built 2 playgrounds in the Taney Avenue and Hume Springs neighborhoods, and worked with more than 40 nonprofit partners to provide services to more than 10,000 underserved kids in the City of Alexandria. During this time, Brooke has run one marathon every month to raise awareness and raise funds for RunningBrooke. She has run at least one marathon in every state, one on every continent, and on October 30, 2016 she ran her 100th marathon at the Marine Corps Marathon. That’s 4,400,000 marathon steps!